When I think of prose poetry, I think of Anne Boyer. In Garments Against Women, her writing melds the two genres perfectly in a manner so seemingly effortless that it could only be the result of extremely intricate work. There are so many lines in here that I wish I could just tear off the page and take with my everywhere. Poetry. Literary Nonfiction. Women's Studies. GARMENTS AGAINST WOMEN is a book of mostly lyric prose about the conditions that make literature almost impossible. It holds a life story without a life, a lie spread across low-rent apartment complexes, dreamscapes, and information networks, tangled in chronology, landing in a heap of the future impossible. Available forms like garments and literature are made of the materials of history, of the hours of women's and children's lives, but they are mostly inadequate to the dimension, motion, and irregularity of what they contain. It's a book about seeking to find the forms in which to think the thoughts necessary to survival, then about seeking to find the forms necessary to survive survival and survival's requisite thoughts. Anne Boyer is a poet who lives in Kansas. She is the author of THE ROMANCE OF HAPPY WORKERS (Coffee House Press, 2008) and GARMENTS AGAINST WOMEN (Ahsahta Press, 2015). “In this textual hybrid of rhythmic lyric prose and essayistic verse, visual artist and poet Boyer (The Romance of Happy Workers) faces the material and philosophical problems of writing—and by extension, living—in the contemporary world. 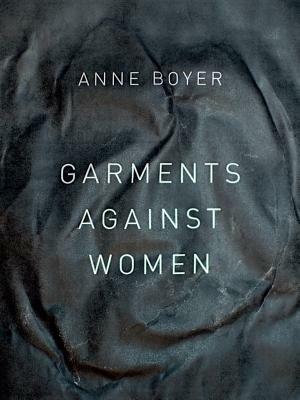 Boyer attempts to abandon literature in the same moments that she forms it, turning to sources as diverse as Jean-Jacques Rousseau, the acts of sewing and garment production, and a book on happiness that she finds in a thrift store. Her book, then, becomes filled with other books, imagined and resisted.